Toni: A man who lies cannot love. Stephanie: Now that sounds like something out of a fortune cookie. Gene Saks is best known for directing adaptations of two Neil Simon plays, The Odd Couple and Barefoot in the Park. 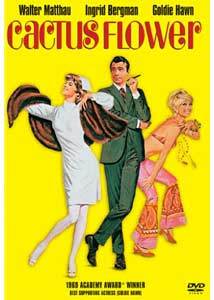 Appropriately enough, his next film was 1969's Cactus Flower, the Neil Simon play that Simon never wrote. It's actually a filming of the Broadway adaptation of a French farce, but the sharp dialogue and contrived comedic flair feel like pure Simon shtick. Lifelong bachelor Dr. Julian Wilson, DDS (Matthau, affable as always) is quite fond of his young lover Toni (Hawn, in her breakthrough Oscar�-winning performance), but he doesn't want to worry about commitment, so he tells her he's married. That's all well and good until a despondent Toni tries to commit suicide. She's saved at the last minute by a neighbor (Lenz), but the close call scares Julian into proposing. Which leaves the small problem of his divorce. From his imaginary wife. Legendary Swedish actress Ingrid Bergman plays Stephanie, Julian's gruff secretary, with a stiff charm�she treats him alternately like a husband and a child, fixing him sandwiches and taking care of all of his patients' needs. Julian convinces her to play his wife, and to go through the motions of breaking up with him for Toni's benefit. The situation, of course, gets much more complicated as several new characters are added into the mix, and it's delightful watching Cactus Flower bloom and grow in unexpected ways. Surprisingly, the story never becomes too predictable�the ending isn't a surprise, but it certainly isn't as telegraphed as in most romantic comedies. Though the storyline invites broad humor and rapid-fire dialogue, things remain more or less leisurely, and lots of laughs are lost in the process. Saks seems to be holding back, letting us get to know the characters, and I'd say the more obvious humor has definitely been downplayed to give them more time to develop naturally. This, of course, also means the film has some slow spots, but the tradeoff is worth it, if only because of the delightful cast. Hawn is particularly charming, an effervescent bubble of giggles and intense emotions and shows an affecting naivet�. She gives a lightweight role more substance than it probably deserves. There's a lot to like in Cactus Flower, even today�innocent humor, a dance scene that has dated so badly it's almost camp, and at the center of it all, a winning performance from Hawn. It's an undemanding comedy with an actress that demands your attention. Image Transfer Review: This is a very nice transfer for the age of the film, with strong, saturated colors (though perhaps skin colors look a bit off, skewing towards reddish tones). Source material looks very clean, with few noticeable flaws and unobtrusive grain. Black level is fairly good, but the detail in darker scenes is lacking. A few scenes show light aliasing, and edge enhancement is certainly present if you look for it. Audio Transfer Review: Audio is presented in English mono, with a clean but somewhat dated sound, limited fidelity and occasional harshness on the high tones. Extras Review: Three trailers are included: Cactus Flower, Groundhog Day, and Seems Like Old Times. Though it doesn't generate a lot of laughter, Cactus Flower is entertaining enough as goofy farces go. The DVD may be barebones, but the audio/video quality is great for a film of this vintage.